Although our founder, John Malki, is no longer with us, we still love and remember him. If you didn’t get the chance to meet John, here’s a little about his life from our local newspaper, The Sun. John Malki, a longtime resident of San Bernardino, died Nov. 12 of cancer at Kaiser Permanente Medical Center in Fontana. He was 79. He was born Aug. 17, 1925, in Beirut, Lebanon, and was the oldest of his parents’ eleven children. At 15, he quit school and began working to help support the family. He worked in several locations mainly as a mechanic during the 1940s through the 1950s, including Palestine, Lebanon and Syria. Malki was sponsored for a U.S. visa by a Presbyterian minister in Columbus, Ind., and was able to move to America in 1956. In 1957 he moved to Whittier. He lived there a year before moving to San Bernardino, where he worked as a mechanic. “He was an expert in foreign cars because where he learned to be a mechanic, there weren’t a lot of American cars,” said David Malki. 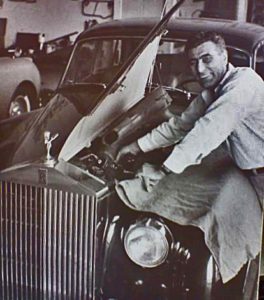 In 1960 Malki opened his automotive repair business. It was the first import-only auto repair shop in San Bernardino. Other survivors include his wife, Linden; a son, John Malki Jr. of San Diego; two daughters, Mary Cariaga and Zeny Androus, both of San Bernardino; two brothers, Elias Malki of Upland and Peter Malki of Escondido; four sisters, Zeny Ward of Vista, Rebecca Noma of Northridge, Sarah Pourciau of Oceanside and Rashael Malki of Upland; and six grandchildren. Services were held. Montecito Memorial Chapel in Loma Linda handled the arrangements. Donations may be made to the Calvary Baptist Church Fire Rebuild Fund, 3701 N. Sierra Way, San Bernardino, CA 92405. © 2004 The Sun. All rights reserved. Reproduced with the permission of Media NewsGroup, Inc. by NewsBank, Inc.